Need to figure out how to get married at San Francisco City Hall? This is everything you need to know for your San Francisco City Hall wedding. It is the most up-to-date, concise resource you will find anywhere. San Francisco City Hall has all the elements that make it the perfect ceremony venue: beauty, location, intimacy, and budget. Every time we step inside, we are still blown away by the breathtaking architecture. Civil ceremonies are intimate and an affordable alternative to more traditional ceremonies. As photographers, we appreciate the natural light that flows into the building alongside the intricate architecture. Due to all these features, City Hall easily remains one of our most favorite wedding ceremony locations. So here it is, the ultimate guide to getting married at SF City Hall. While getting married at City Hall is a simple process, especially in comparison to large traditional ceremonies, there are plenty of details that only those familiar with this gorgeous location can provide. We have photographed over 400 SF City Hall weddings and currently photograph over ten every month. 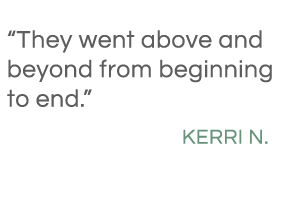 As a result, we are well versed in every detail and are happy to guide our clients through every step of the process. The Red Eye Collection team is proud to be personally recommended by the San Francisco City Hall Event Staff! You can find our information and flyer in their office on the fourth floor. You can either purchase your marriage license ahead of time or the day of the wedding, before the ceremony. We recommend getting the license ahead of time; it’ll make the process of checking in for your ceremony much smoother. Just make sure that you schedule your ceremony within 90 days of receiving your license as it does expire! Currently, the cost is $107 for a marriage license at San Francisco City Hall. This cost does change periodically; you’ll be able to view the current rate when you make your appointment. Appointments are available Monday through Friday from 8:15 am to 3:30 pm. When it’s time for your appointment, head to Room 168 on the first floor of City Hall – and don’t forget your IDs! Checking in and meeting their officiant just before their San Francisco City Hall wedding ceremony. 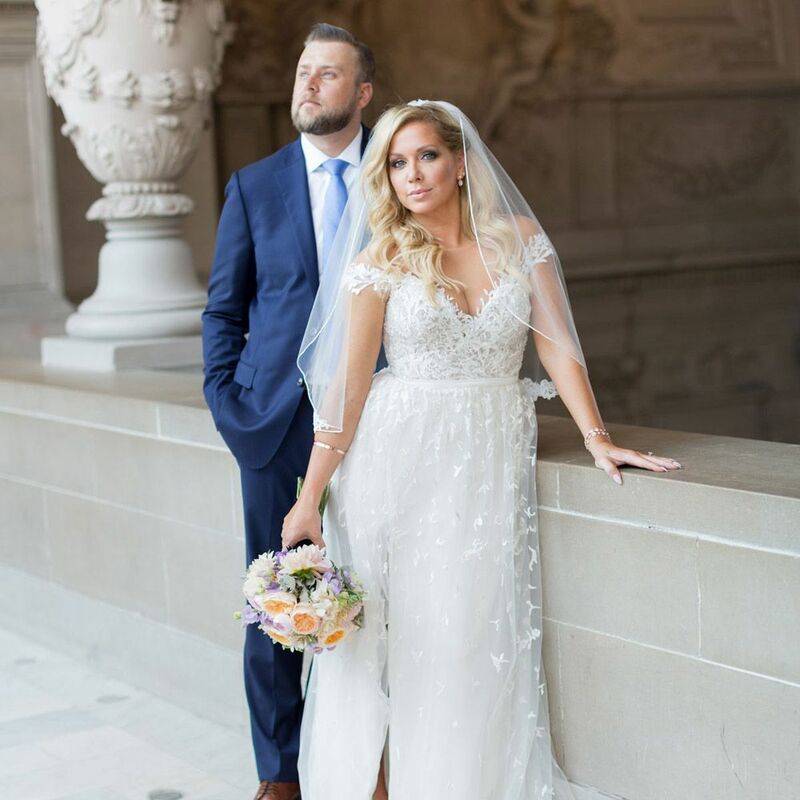 There are two types of ceremonies at San Francisco City Hall – civil ceremonies, which are public and by far the most popular, and private ceremonies. Civil ceremony appointments are available Monday through Friday from 9:00 am to 3:30 pm and can be made up to 90 days in advance. Ceremonies are performed on the beautiful Rotunda, at the top of the grand staircase. Only six guests are permitted to attend civil ceremonies due to space and the number of couples who book at the same time (up to three couples are scheduled for every half hour slot). It’s common to see excited couples and their guests waiting their turn along the edges of the Rotunda’s second floor. Civil ceremonies are short, just six minutes long, and a volunteer judge officiates. The reservation cost for a civil ceremony is $83. You must present your wedding license at the time of the ceremony. If you are getting your license the same day as the ceremony, schedule your license appointment at least 30 minutes before your ceremony appointment. When you arrive the day of your wedding ceremony, you must check in to the Information Desk in Room 168 in San Francisco City Hall. Make sure to arrive at least ten minutes before your appointment. We recommend getting there much earlier. Traffic and parking often cause delays, so give yourselves lots of time. You couldn’t ask for a better location in which to spend extra time! Make your civil ceremony appointment online. For $1,000, you get private use of one of three locations: The Mayor’s Balcony, 4th Floor North Gallery, or 4th Floor South Gallery for one hour. Both of the 4th Floor Galleries are similar in appearance to one another but are distinct from the Mayor’s Balcony. All locations are beautiful, and it is personal preference when choosing a site for your ceremony. Private wedding ceremonies are held Monday through Friday with the earliest ceremony beginning at 9 am and the latest beginning at 3 pm. Up to 100 guests are permitted to attend this one-hour ceremony. If you’d like to use any equipment such as tables and chairs, those are available from City Hall for an extra rental fee. The Mayor’s Balcony seats up to 40 guests and the 4th Floor Galleries seat up to 60. Remaining guests stand for the ceremony. You must provide an officiant as San Francisco City Hall does not offer one for private ceremonies. To make a reservation for a private ceremony, call (415) 554-6079 or go to the City Hall Events page for more contact info. For $5,000, you get SF City Hall all to yourselves. This package accommodates up to 200 guests and includes insurance and equipment rental. If you have more than 200 guests, there is an additional charge of $7 per guest ($100 minimum, which equates to 15 extra guests) that includes additional equipment and insurance. When: For the North Light Court, set-up begins at 2 pm and break-down must conclude by 2 am; times vary for other locations. There are a lot of options if you’re looking at organizing a large private wedding with exclusive use of areas of City Hall. You can reserve a space during public hours (Monday through Friday, 8 am – 8 pm), book the North Light Court for the evening, or even reserve both the South and North Light Courts along with the Rotunda for an entire Saturday afternoon and evening. The cost for an evening or weekend wedding varies depending on where the wedding is hosted, the number of guests, and the requested time period. There is more flexibility with a private weekend or evening wedding, as outside vendors are permitted, and you have the option of lighting up the outside of City Hall itself for an extra fee. When it comes down to choosing the best day of the week and time of day, it is completely a matter of personal preference. Every couple has a different idea of what will make their wedding day absolutely perfect, and this will affect your decision. All the logistics of your particular plans will come into play as well. When consulting with us over the phone, we can help guide you through this decision! Per California state law, one witness needs to be present during the ceremony. This witness must accompany you when you check in to Room 168 before your ceremony time. (Remember to arrive at least ten minutes early, though we suggest giving yourselves more time.) 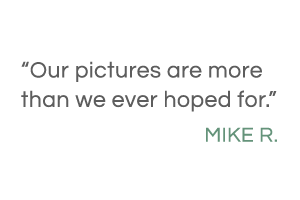 If it’s just going to be the two of you, your photographer would be honored to act as your witness. This is something our photographers here at Red Eye Collection love to do! San Francisco City Hall assigns a judge to officiate your wedding (for public, civil ceremonies only), who you will meet on the day of your ceremony. These judges serve on a volunteer basis for City Hall weddings. If you’d prefer to have a friend or family member officiate for you (recommended for private wedding ceremonies), they can apply to be a Deputy Marriage Commissioner for a Day. Civil ceremonies (public) permit up to six guests. One-hour (private) weddings permit up to 100 guests. Two-hour (private) weddings permit up to 200 guests with an extra fee for each guest. Evening and Weekend wedding guest count are dependant upon the area used at City Hall. Parking on the streets around San Francisco City Hall can be challenging, even in the middle of the week. It’s a popular place! It is much easier to park in the Civic Center Parking Garage across the street, but be aware – it’s hard to spot! The parking garage is underground and has a single entrance on McAllister St., adjacent to Civic Center Plaza, near the corner of McAllister and Polk. It’s easy to miss – just look for the single Parking sign above the entrance. Alternatively, take public transit to get to San Francisco City Hall. Take BART into San Francisco and get off at the Civic Center station. From there it’s a short walk just three blocks west to City Hall. On the day of your ceremony, check in to Room 168 inside San Francisco City Hall. Civil Ceremonies (the popular public ceremonies during weekdays) are performed on the Rotunda at the top of the grand central staircase. Private ceremonies have more flexibility than civil ceremonies. For weekday private ceremonies, you can have your wedding on the Mayor’s Balcony, 4th Floor North Gallery or the 4th Floor South Gallery. The 4th Floor North Gallery is a popular place for photographs since the light is always perfect! 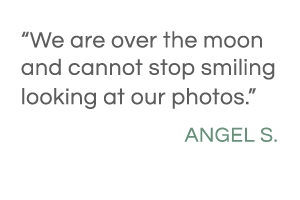 Our photographers have multiple locations throughout San Francisco City Hall where we typically photograph our couples. Red Eye Collection always makes sure to get a photo at the iconic photo at the entrance to City Hall. Red Eye Collection is one of the very few wedding photographers endorsed by San Francisco City Hall Event Staff! Our information and flyer are available in their office on the fourth floor of City Hall. While City Hall itself does not offer wedding reception services (unless you opt for an evening or weekend package), we do recommend that you and your guests celebrate in your own way. Most couples and their few guests head to a nearby restaurant where they’ve made a reservation. Often they reserve a private dining room, which we think is an excellent idea. With a private dining room, you and your guests will have more privacy and more time to celebrate this exciting day. When looking for a restaurant, there are a few things to keep in mind. Be sure to read this article we wrote all about restaurants near SF City Hall, including our top five choices. 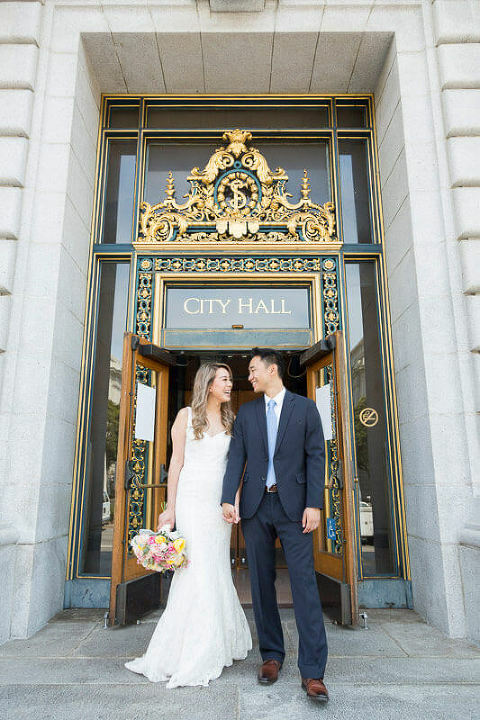 We hope our guide to How to Get Married at San Francisco City Hall answered all your questions! 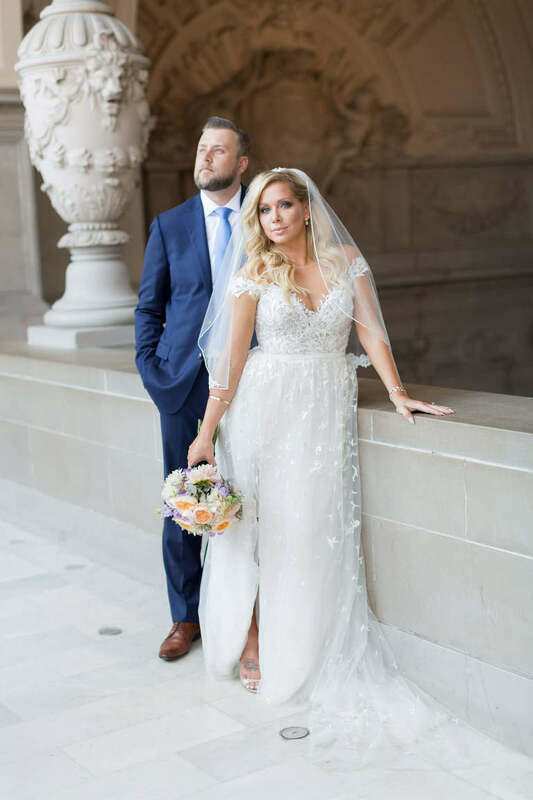 SF City Hall weddings are our passion and we love to keep this in-depth guide on how to get married at San Francisco City Hall as updated as possible. If you have any input on what we’ve written, please get in touch! We’d love to hear from you.